A sauna is a steam room known to be effective for natural healing and prevention. For centuries, saunas have been a way of life for many people around the world. In modern society, saunas are a common feature in gyms, spas, and homes. Unlike traditional saunas that use conventional heaters to warm the air, we now have infrared saunas that use light to heat the body directly instead of the air around you. This type of sauna is more appealing as it causes vigorous sweating but at lower temperatures. Today we will be looking at the best infrared saunas. These are well-built models that are the current top infrared saunas on the market today. Are there any dangers associated with the use of Infrared Saunas? What is EMF and why is Low EMF important? Heat therapy is not new in contemporary society. We have seen native Americans, the Chinese, and Eastern Europeans using hot air baths and sweat lodges to reduce stress and detoxify the body. The infrared sauna is designed to use light and heat to replicate the environment of the traditional sauna. It makes it possible for everyone to use it, including those who can’t tolerate the high temperature of a traditional sauna. The main difference between a traditional steam sauna and an infrared sauna is the heat. The temperature in a steam sauna can go as high as 1600 to 2000F when water is poured over the rocks while the normal temperatures will be 140F to 180F. Infrared saunas only get to 1200-1500F. For those whose bodies cannot tolerate high temperatures, you will find it extremely uncomfortable in a steam sauna. Steam saunas rely on heated steam to create a humid experience while infrared saunas rely solely on heat from infrared heaters to get you sweating and achieve the similar effects. Traditional saunas use more heat to heat the air around you to increase your body’s temperature, but infrared heat penetrates the body to increase the body’s core temperature. As such, you will sweat even more profusely than in a steam sauna at a lower room temperature. The heat from an infrared sauna can penetrate the human tissue and produce lots of health benefits. If you are looking to achieve your wellness goals, an infrared sauna might be just what you need. Perhaps the first benefit of using an infrared sauna is the comfort it brings to the body and mind. The light and heat is soothing; unlike what you would experience from a traditional steam room. The infrared light will also help soothe your muscles and allow you to relax more easily. If you are an athlete, using an infrared sauna can help improve your range of motion. This is because it will loosen tight muscles which help you recover faster. Infrared energy raises the body’s temperature similar to what you would experience in moderate to vigorous exercise. When your core temperature increases, your heart rate also rises. Your body will start to work harder to lower your body temperature. This results in burning more calories as your bodies heart continues to work to cool your body down. It is estimated that your body can burn up to 600 calories in a 30-minute infrared sauna session. Sweating is our body's natural way of eliminating toxins. Infrared saunas allow the body to eliminate seven times more toxins than when using a traditional sauna. The deap penatrating heat from the infrared saunas is what makes this type of sauna so much better than a traditional sauna. Detoxification helps to improve the body’s immune system and promotes the efficient functioning of the body’s biochemical processes. Infrared sauna therapy is associated with natural pain relief as well. The infrared sauna heat penetrates the joints, muscles, relieving tension and inflammation. This reduces soreness and muscle spasms, and in turn promotes natural healing by the body. It does all this by increasing blood circulation around the torn areas, and as you know, more antibodies and oxygen means quicker recovery. Infrared sauna therapy helps to clear toxins from the skin. When using near-infrared wavelengths, the skin layers (epidermis and dermis) are purified as toxins are eliminated through the pores. It stimulates production of more collagen which reduces wrinkles and improves the overall skin tone. The use of near infrared saunas has shown to increase cell regeneration. This improves human tissue growth and enhances skin healing. Overall, having an infrared sauna is an effective method to enhance your body’s mechanisms and processes. It enhances the body’s natural defenses which help to keep you in top health condition. It reduces stress levels and helps you to keep a more balanced daily routine. An infrared sauna works much like the sun as the rays causes you to feel warm even though the room is at a lower temperature its important to note that infrared light does not damage the skin or cause sunburn as the sun's rays do. In an infrared sauna, the heaters produce infrared heat which is absorbed directly by the body. This, in turn, makes you feel quite warm. The dangers of an infrared sauna are much like any therapy associated with excessive heat. This means that you are exposed to these dangers if you spend too much time in the sauna. Exposure to long periods of excessive heat can cause overheating which results in dehydration and fainting. Dehydration also causes depletion of electrolytes. Seniors and children are at a much higher risk of overheating and dehydration. In children, their bodies heat up faster while in seniors, their bodies become prone to overheating as the sweat gland function decreases with age. The use of alcohol and drugs like antihistamines diuretics, barbiturates, or beta-blockers in a sauna decreases the body’s ability to perspire. Also, if you have certain disorders like diabetic neuropathy, multiple sclerosis, adrenal suppression, and Parkinson’s disease, doctors advise against using any type of sauna. The American Journal of Medicine in their Feb 1st 2001 issue advise against using an infrared sauna for people with certain cardiovascular conditions including a narrowing aortic valve, unstable angina, or if you have recently suffered a heart attack. There are dangers associated with using an infrared sauna if you have a silicone implant. It’s always important to check with your doctor before using an infrared sauna. EMF (Electromagnetic Field) is a fundamental force of nature. It is produced by all matter whether living or nonliving. The difference in this electromagnetic radiation is in the way it interacts with biological tissue. EMF falls into two categories. Ionizing and non-ionizing magnetic fields. Ionizing EMF includes high-intensity, high-frequency, short wavelengths that can displace electrons. This includes UV, X-rays, and gamma rays which can cause damage to tissue in what we commonly call radiation. The non-ionizing EMF do not have the energy to ionize molecules and atoms. They are characterized by low intensities, low-frequency, and long wavelengths. These are what you find as microwaves, radio waves, visible light and infrared. Some levels of non-ionizing EMF are still believed to be dangerous. As such, exposure must be limited to 3mG. These are EMF levels known NOT to have any short term or long-term effects on the human body. If you want to get the best benefits of infrared sauna, the JNH Lifestyles 2-person model is a good pick. It relies on carbon fiber heaters that are ETL approved. This model exhibits quality and reliability in an infrared sauna that uses green wood in its construction. This means you get an efficient cabin to help you relax while getting the best value for your money. The JNH Lifestyles Infrared Sauna has seven high-quality carbon fiber heaters. They are strategically located at the back and lower part of the cabin to improve overall heating. This unit is designed using a see-through door. It is safety glass that can tolerate high temperatures. You get more insulation and better visibility from within the cabin. Other than the thick glass, this sauna boasts a dual wall construction. This improves the insulation of the high-quality and sustainable timber used. Remember that no-plywood is used in the cabin so you can expect long-lasting use of this sauna whether in the home or office. This infrared sauna comes with two premium speakers and an auxiliary plug. There is a volume rocker and a switch. It allows you to play music from any portable audio device including your smartphone or tablet. Now you can relax and experience total fulfillment as you de-stress with your favorite music. The JNH Lifestyle Infrared Sauna uses LED lights. These are more energy-efficient than conventional bulbs ensuring that you will have long-term usage of your sauna. They are also cost-efficient. This unit also comes with a digital control panel. It helps you to make quick and easy selection of the temperature and duration of the sauna. This sauna comes in a unique tools-free design. You don’t need to go looking for an expert as the panels click together seamlessly. You will be able to start using this sauna right away after plugging it into a regular home electric socket. You will get a five-year warranty on the parts including the speakers which says a lot about the reliability of this model. Are you looking for a practical infrared sauna? Then, you will be impressed by the Sante Fe SA2412DX Infrared 3-Person Carbon Sauna. It uses seven carbon fiber heaters which means that the heat released is more effective. This model allows you to enjoy the infrared sauna by helping your body to rejuvenate and relax from the comfort of your home. With a 3-person corner design, you can place this sauna at any corner in the house. Most people like it in the sunroom where you get to relax in one room. The seven carbon fiber heaters are located evenly around the sauna. You have one heater on the floor, two on the left back wall, two on the front bench, and two on the right back wall. This ensures you have even heat which assures effective heat penetration. This infrared sauna comes with an oxygen ionizer which releases oxygen and negative ions into the air. It keeps the air fresh by killing bacteria. You’ll also find a 7-color chromotherapy lighting. It is a system that has seven stimulating colors to promote blood circulation, activate skin cells, and ease nerve pressure. You will like that it has a reading lamp which you can adjust accordingly. It lets you take a book or magazine with you to read as you relax. Not to mention, it also includes an FM/CD player and a speaker system to give you the convenience of listening to radio or music from an iPod or Mp3 player. This model is thoughtfully made with an ergonomic backrest. It provides a comfortable sitting position which prevents pressure to the back. You can also assume a relaxed position where you can take in the heat as your body detoxifies and heals after a long day. It is an excellent pick if you are an athlete and you want a unit with infrared heat that can benefit the your body. It has adjustable air vents to allow fresh air into the sauna. This means you are not stuck with a sauna that is stuffy. The E-Z touch control pad comes in handy to control all the setting of this infrared sauna from the inside out. The Sante Fe SA2412DX uses solid Hemlock wood in the creation of this sauna. It exhibits dependable quality and has a design that can complement décor in any home. It has a tinted bronze, glass door for excellent insulation and outdoor visibility. The quality of this sauna is unlike any other. For those who require a professional quality infrared sauna, the JNH Lifestyles Joyous 3-Person model is the one for you. It boasts high standards using carbon fiber heaters that are spread out over the entire surface for efficient heat distribution. This is a unit that will use standard 120V electricity sockets which means you will not have to have any wiring work done in your home or office. This sauna uses three carbon heaters at the back wall, two heaters around the leg area, one at the calf area, and two at the shoulder area. It is incredible how well it distributes the heat so that you can get the full benefits of the sauna. Like the two-person model, this unit comes with LED lighting. It provides you with long-term usage of the sauna since you won’t be looking for replacement parts for a long time. The sauna features a robust structure in a light wood finish. This is thanks to the use of Canadian Hemlock wood. It includes a beautiful groove finish without any chemicals added to the wood. You have a guarantee of being able to use this sauna for many years. It will take around 40 minutes to achieve the right level of infrared heat. The settings are also easy to choose on the digital control panel. It is complemented by two premium speakers and an auxiliary plug, so you can connect audio devices. This sauna is a professional grade home sauna. This three person sauna allows you to install it anywhere since the double walls ensure no heat loss no matter the ambient temperatures. When you want to relax and rejuvenate after a long day, nothing beats the relaxation brought about by an infrared sauna. This unit by Radiant Saunas allows you and your partner to partake in an invigorating activity from the comfort of your home. It is a 2-person infrared sauna that uses six carbon fiber heaters. This model heats ups much faster than units that use ceramic heaters. It has low EMF which allow it to get under the skin without potential risk. It can achieve a temperature of up to 1420F which is safe and practical for most people. The infrared wavelength of this sauna ranges from 5-12 microns. This is a safe wavelength to give you the best of infrared energy. With the oxygen ionizer, you stand to gain more as it releases negative ions associated with pain therapy and natural healing of the body. You’ll also like that it has a 7-color system to improve your overall experience at the sauna. This sauna features an attractive design from solid, Canadian Hemlock wood. We expect it to last for a long time due to the sturdy build quality. It also includes a bronze tinted glass door. From the inside, you get enough privacy while being able to view what’s on the outside. It provides more than enough room for two so that can enjoy company while in the sauna. We like that it has a 7-year warranty that is longer than any of the models on this list. It promises to last a long time while giving you the health benefits you can expect. 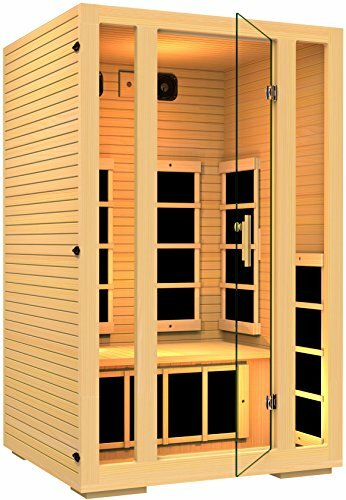 This Infrared sauna is the only certified model by Intertek known to have zero EMF. It allows you to share something good and to relax with a loved one. Having zero EMF makes this an incredible choice if the fear of exposure to the slightest levels of EMF is keeping you from enjoying the therapeutic effects of an infrared sauna. You have a sophisticated cabin that uses seven commercial grade carbon fiber heaters. These are certified to contain no EMF which leaves you to enjoy the full benefits of infrared heat. You stand to gain from reduced levels of stress, better blood circulation, and an improved immune system. The cabin enjoys a durable construction from Canadian Hemlock wood meaning it will provide long-term service. It does not have any plywood or additional chemicals as the strength is acquired through the tongue and groove finish. A dual wall allows you to install the sauna just about anywhere around the house. With a safety glass door, it provides excellent insulation while allowing you to maintain communication with others on the side of the cabin. You’ll also be able to watch a loved one who is heat sensitive so that you can be there to help them control the temperature. This model also follows the design of other saunas in the JNH Lifestyles line including LED lighting, premium speakers, and a digital control panel. For a zero EMF infrared sauna, we can say you are getting great value. An infrared sauna is the go-choice for many modern homes. They do not cost a fortune and they are easy to install and use. You stand to gain lots of benefits from using an infrared sauna. From detoxification to relaxation, and improved body immunity, you have every reason to get the best infrared sauna. Our list has entailed the top best performers. If you are on a budget, the JNH Lifestyles 2-Person Far Infrared is an excellent choice. You can also get a premium model like the Sante Fe SA2412DX Infrared 3-Person Carbon Sauna. All our categories capture high-performance brands. We hope you will find our list informational before you make a choice.